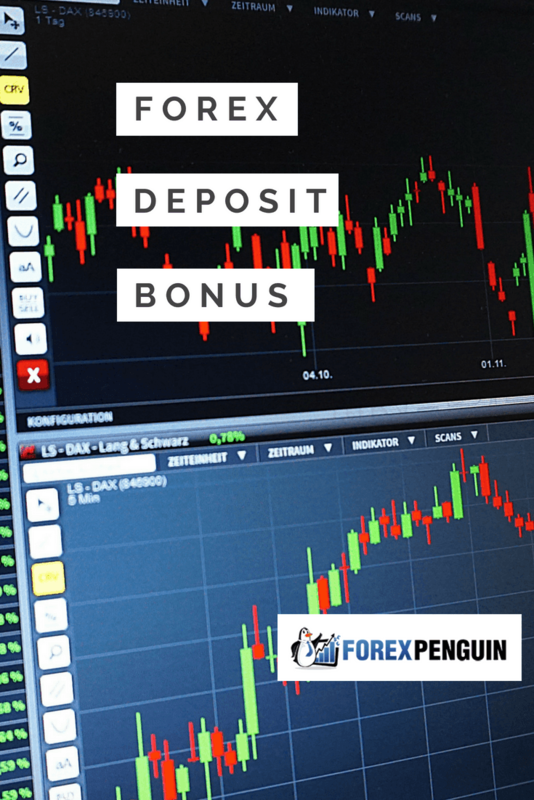 Skip to the forex deposit bonus 2019 listing. All About Forex Deposit Bonus. What Is Forex Deposit Bonus? Why Do Brokers Give You A Bonus? More On How Forex Deposit Bonuses Work. How Does A Forex Deposit Bonus Benefit The Broker? How To Choose The Best Deal. Where To Find The Best Forex Deposit Bonus? Forex deposit bonus is not a new term to seasoned traders. For the longest time, brokers have been enticing their traders – new and seasoned – with this offer that could ensure they take home a little more money. All forex traders we know are after the big win. You want to put your money where you know it will be fruitful. Winning could come in the form of a big market shift that puts you in the perfect run to take money home, or as a forex bonus that brokers give to keep you enticed. Essentially, a forex deposit bonus is an offer by the broker to return to your account a percentage of the money you deposited when preparing to make transactions. These bonuses range in value from 20 to 100% of your deposit, but there are a few conditions. The 100% bonus is only given to new traders who just signed up with the brokerage to encourage them to start trading. After this initial welcome, you join the other traders who earn less than 100% on their deposits. As a rule, the nature of this deposit demands that you make a deposit first before you qualify. Other conditions include trading within the minimum limits created by the broker and also keeping your account active. Also, worth noting is that the bonus is only made available for withdrawal once the minimum requirements have been met. Brokers want you in their enclave, and so they will offer these deposits to either attract a new trader to trade with them or entice a seasoned one to come on board. They want to increase their trading volumes and keep loyal traders in the house, which they can only do by giving a bonus with no heavy strings attached. It is worth noting that a trading bonus is not a free gift from your broker. They are giving you a little money to thank you for trading with them and making them some money. As you may know, a broker makes money on commissions or on spreads, and so the more you trade, the better his pocket is going to look and feel. So, here is what happens; you deposit money with your preferred broker, they top you up with the agreed bonus as a percentage of the deposit and you start trading. If the bonus is 50% of the deposit, then you can start trading with 150% instead of 100%. Sweet, isn’t it? Some brokers will offer you an abnormal bonus that you cannot withdraw. You can trade with it, but you can never have it, which makes it unreal as it will never be your money. Don’t fall for those as they are not worth your energy. You would rather have a bonus that you can withdraw after meeting the set conditions by your broker as they are attainable. What conditions are those? We will address them next. Say you have $1000 and sign up with a broker who gives you a 50% bonus on your first deposit. Now, you will be trading with $1,500 but the catch is you cannot withdraw the extra $500 right away. Wouldn’t make any sense to the broker now, would it? The broker will let you know your trading volume, mostly measured in lots. Let say they ask you to trade 1 lot for each USD 8 of the bonus. So, your trading volume will be $500 divided by $8. You will need to trade 62.5 lots to qualify for withdrawal of your bonus deposit. If you fail to meet this trading volume, you can only withdraw your initial deposit less any loses you may have made along the way. The bonus makes things easier as it offsets any loses you may have made. Brokers make money when you trade and by giving you the bonus, they are cushioning you against loss and thus encouraging you to trade more. Take for instance a case where 1 pip is equivalent to $10. The broker will earn 1 pip as commission fees for any new trade you open. If your broker requires that you trade 62 lots to qualify for the deposit, you will be paying $10 every time you trade for the 62 lots. By the time you trade enough times to make the required trading volume, they will have made almost double the value of the bonus. Is that a bad thing that they make so much? Not really as they also incur lots of expenses to make the trade possible and even though they will not make a loss, they will not exactly make a net profit of $600 from your $500 deposit. Brokers are more interested in the numbers – of traders –and so these bonuses are part of their customer-retention strategy. Choosing a good bonus start with choosing a good broker. You want a person you can trust and one that has a good reputation with other traders. Ask a seasoned trader for recommendations if you are new. Check that both the broker and the company that is going to accept your deposit are regulated. Next, read through the conditions of the broker. Do not go for terms and conditions you cannot meet as they will hinder you from achieving your plans and getting your deposit balance. The other thing you have to check under the terms is the trading period the broker has given then measure it against your trading history. If you are getting a 50% forex deposit bonus on condition that you trade your given lots in 90 days but that is not possible according to your trading history in the past, then this bonus is not for you. Go for a bonus with a longer trading period – like 180 days – so that you don’t have to make silly trades just to meet your trading quota before the expiry of your bonus period. The answer is obvious. For the best daily bonuses, check our listing below. If you are a new trader, you might want to check out the forex no deposit bonus instead. IronFX has multiple choice of deposit bonus. Choose the correct one to maximize your trading experience. FXGiants has 3 different types of deposit bonus. Click in to find out more about these bonuses. Xtreamforex gives 100% deposit bonus for any minimum deposit of $100. Make sure you read the terms and conditions. Now you can maximize your deposit fund with TRUE FOREX ‘Deposit Bonus’ up to 20% every each of your deposit. Deposit and get a boost on your balance. Welcome Deposit Bonus is available for new clients for every deposit made within 10 business days after account opening date….